Summary: Oil painting showing a green wooded area on a fine day. Bristol and the River Avon can be seen in the distance. 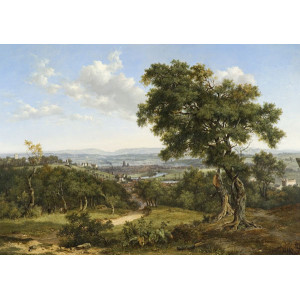 Description: Nasmyth's landscapes were influenced by 17th century Dutch Masters. In the 17th century the physical geography of The Netherlands underwent enormous transformation. The reclamation of about two hundred thousand acres of land from inland sea, by means of a complex system of dikes and drainage, created a large area of land, punctuated by a grid like system of canals and waterways across the drained areas. The visual preoccupation with local landscape formations coincided with this first large-scale creation of land. Dutch painters depicted their fascination with the changing landscape in their works. Perhaps British landscape painters responded to similar dramatic changes; the innovations in transport such as canal systems and railways, the surge in industry and manufacturing, and the growing towns and cities in their work. Description: The Scottish artist Patrick Nasmyth was the eldest child and pupil of the well-known painter Alexander Nasmyth. Patrick became a landscape artist. He was very attentive to the fine details of nature. He studied different types of clouds, and made sketches of fields, hedgerows, rivers and forests. Although he sometimes included people, they were subordinate in the overall effect of his pictures. In boyhood he injured his right hand in an accident, so he painted with his left one. Another misfortune was an illness which resulted in deafness. Hoping to escape from his feeling of total isolation, he came to London where his works immediatley attracted notice. Nasmyth showed his works at the Royal Academy of Arts in London, as well as the Scottish Academy. He was never financially successful, but this was due more to his lack of interest in business that to his abilities as a painter. 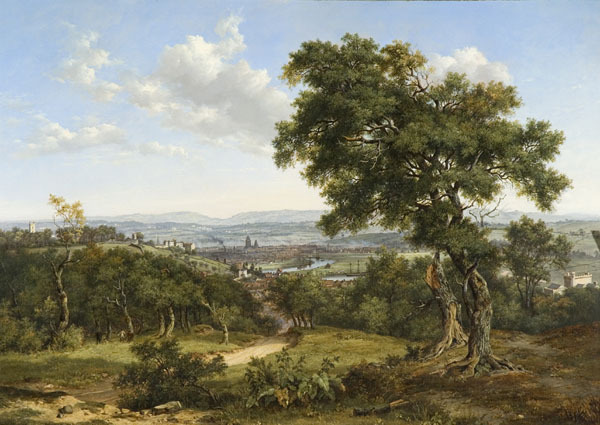 'View of Bristol' was probably completed in his studio from a large number of sketches made outdoors. Nasmyth invites us to share his admiration of this peaceful landscape. We can hardly notice the port of Bristol, which was one of the richest merchent cities in 18th centrury England. Tea, sugar, brass, copper were bought and sold though the port of bristol. Almost two and a half million slaves were transported though the Middle Passage on the ships of Bristol merchants. The docks were at the heart of this business, and most of the elegant town houses were built on the profits of the slave trade. Acquired in 1887, Cartwright bequest.